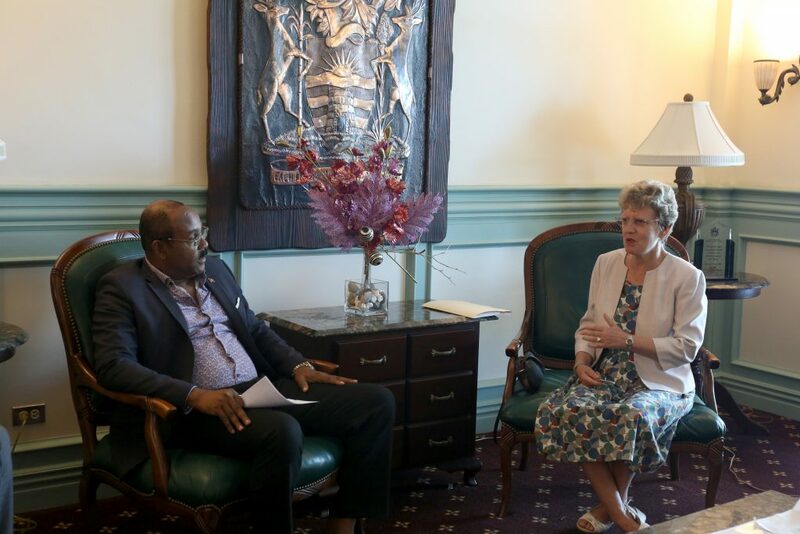 Her Excellency Janet Douglas, British High Commissioner to Barbados and the Eastern Caribbean, paid a courtesy call on Prime Minister, the Honourable Gaston Browne and the Honourable E.P. Chet Greene, Minister of Foreign Affairs, Immigration, and Trade on Monday engaging in discussions on UK–Antigua and Barbuda relations among other critical areas of common interest. Her Excellency commended the Government of Antigua and Barbuda on its initiatives to curb plastic pollution caused by the accumulation of plastic waste in the environment. 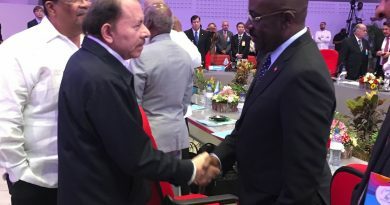 “Antigua is a pioneer in the management of climate change and is setting a good example for other countries throughout the region. Whenever I travel within the OECS, I always remark that Antigua is in the lead when it comes to climate change policies,” High Commissioner Douglas noted. High Commissioner Douglas also disclosed that the British Government, later this week, will announce a compensation package for individuals of the Windrush generation adversely affected by defects in the UK’s immigration policies and practices. She further added that eligible individuals would receive the necessary guidance when submitting claims for compensation. In response, Prime Minister Browne and Minister Greene reaffirmed the Government of Antigua and Barbuda’s commitment to adopting environmentally friendly policies and expressed their gratitude for the UK’s continued support. On the matter of Windrush, both signalled the Government’s concern with the treatment of the Windrush generation. 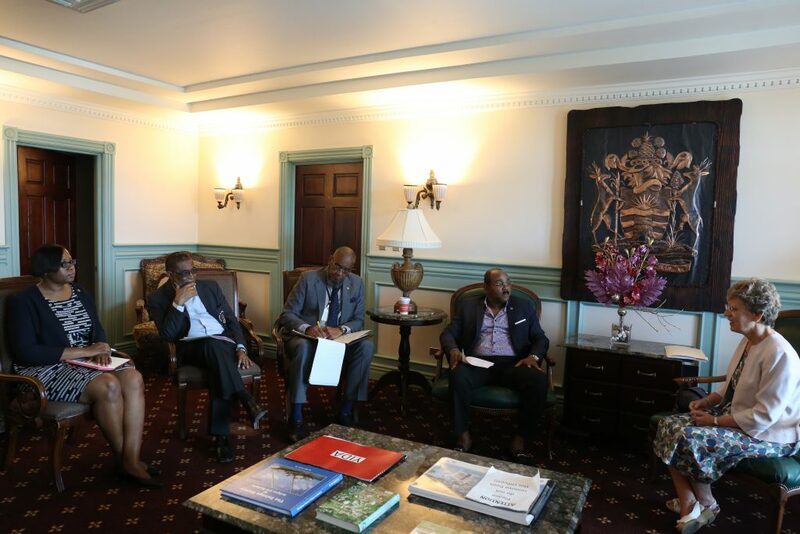 However, they welcomed the Windrush Compensation Scheme and advised that Antigua and Barbuda will continue to monitor the situation. Prime Minister Browne also thanked the UK for the support extended in the rehabilitation of the Sir George Walter Highway and Friars Hill Road. He noted that progress is moderate but remains hopeful that the project will be complete in due time. In soliciting the UK’s support in the ongoing advocacy to reform the eligibility criteria and administration of development aid in the context of the vulnerability and resilience of Small Island Developing States (SIDS), Prime Minister Browne advised that the twin-island nation is due to graduate in 2020 and desires continued engagement with the UK on the issue. 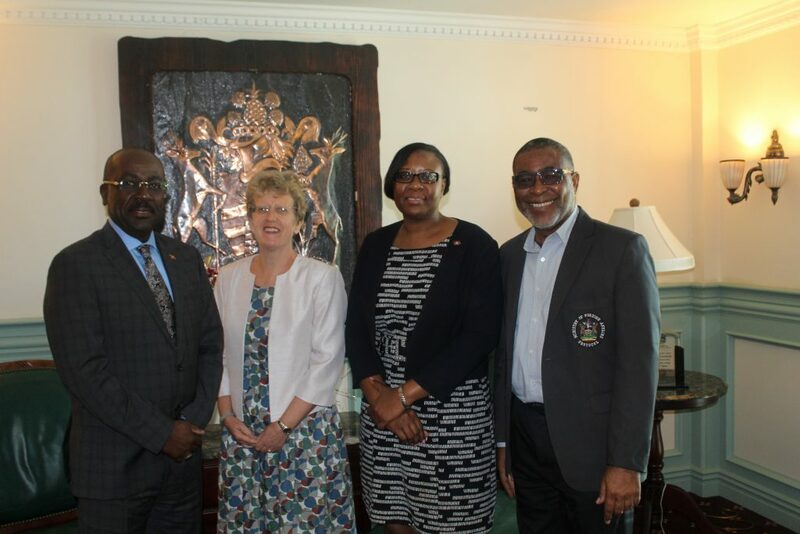 Turning to new developments, High Commissioner Douglas announced that plans to establish a British High Commission in Antigua and Barbuda are in the final stages. She advised that the selected location will serve as a joint residence and office for the resident British High Commissioner. According to Her Excellency, “the office will serve as a mechanism to strengthen [the UK’s] cooperation with the Caribbean as part of its ‘New Caribbean Strategy’. 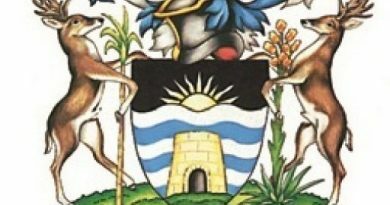 It is anticipated that the symbolic opening ceremony for the British High Commission in Antigua and Barbuda will be held in the upcoming months”. The discussions ended with both Prime Minister Browne and Minister Greene conveying the Government’s best wishes for the UK’s hosting of Cricket World Cup 2019. Also present were Her Excellency Karen Mae-Hill, Antigua and Barbuda’s High Commissioner to the UK; Ambassador Colin Murdoch, Senior Advisor, Office of the Prime Minister; and Ambassador Anthony Liverpool, Permanent Secretary of the Ministry of Foreign Affairs, Immigration, and Trade. (Left-Right) Hon E.P. 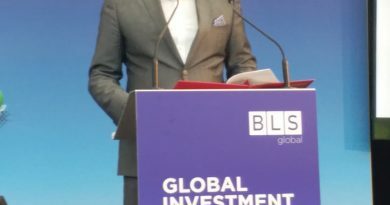 Chet Green, Minister of Foreign Affairs, Immigration, and Trade; H.E. Janet Douglas, British High Commissioner; H.E. Karen-Mae Hill, High Commissioner of Antigua & Barbuda to the UK; and Ambassador Anthony Liverpool, Permanent Secretary of the Ministry of Foreign Affairs, Immigration, and Trade.